Dablo Daares derives from southern Lapland. Goal is either to capture the enemy king or reduce his forces so that only the king remains. All pieces move by single steps and can capture, by the short leap, in all directions. The soldier can only step in the three forward directions. Promotion does not occur. For the soldier, capture is mandatory. For the king, capture is optional. The king can only be captured by the enemy king. A piece moves to an empty adjacent point. If an adjacent point is occupied by an enemy piece, of the same rank or lower, and the point directly behind is vacant, then one may jump over it and capture it, as in checkers. Several pieces may be captured like this in a single turn. Dablo Aasele (below) follows the same rules. As capture is mandatory for the soldier, it is sometimes possible to sacrifice one or more soldiers to enemy soldiers, thus to create a situation where the enemy king can be captured. However, it is necessary to hunt enemy soldiers with the king, although this exposes the king to combinations. 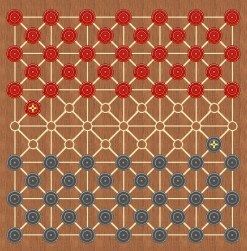 A shortage of soldiers can lead to a lost game as it allows the opponent to continue exchanging soldiers until he wins according to the lone (bare) king rule. This game is strategically and tactically very interesting, and takes appropriately long time, too. Example of simple combination. Here black can win by moving the king to the left (e5-c5). This forces white to capture the soldier, which leaves the king en prise. Another typical combination. Black moves the soldier to nw (f2-e3), forcing the white soldier to capture. Thus, black can capture the enemy king in two consecutive jumps. Dablo Daares (Dåres dablo/tablo/tavelbräde/kloter) is mentioned in connection with the village Daares (Dåres) in Vilhelmina, Lapland, in northern Sweden (Pettersson, 1999, p.402f). This implementation builds on a reconstruction by P. Michaelsen to which I’ve added the lone (bare) king rule and a combined mandatory/optional capture. There exists an incomplete description where a board with 144 fields are described. These are here interpreted as the triangles, thus relating the board to another Laplandian game Dablot Prejjesne. The Daares game is described as having one king and two rows of pieces on each side, and that capture occurs by the short leap. It is thus suggested that Dablo Daares belongs in the category of dablo games and is closely related to Dablot Prejjesne (here). An interesting fact is that the board has the same type of pattern as the African game Kharbaga (here), and the capture rules are reminiscent of the Italian checkers variant Damone (here). The notion of forward moving soldiers that do not promote, but can capture in all directions, is known from Ossetian checkers (here). If the soldiers were able to go in all directions, then there is a lot of movement back and forth which would create monotony. Pettersson says that in certain parts of Lapland has the rule of forward movement only been introduced, at least for the soldiers. This is also borne out by Anta Pirak’s description of “tablo” (1937, pp.17-18). The ‘absolute king’ rule is reminiscent of Italian Damone variants, where capture of the Damones is sufficient for a win. This rule is corroborated by a note to Dablot Prejjesne from 1892 by Wiklund: “The party who first loses all his counters has lost the game. According to agreement, the player also loses whose king is jumped over and thus captured by the other king, in which case normal counters cannot capture the king” (my transl.) [“Den som först förlorat alla sina brickor, har tappat. Efter öfverenskommelse kan äfven den tappa, hvars kung blifvit öfverhoppat och slagen af den andres kung; vanliga brickor kunna då ej slå kungarna”]. There also seem to have existed smaller dablo variants where king capture was sufficient for a win. The suggested ‘lone king’ rule exists also in Shatranj (here). The soldier’s mandatory capture remains a point of contention. This setup uses 33 pieces in five rows on each side. The below source says two rows of pieces on each side, but the dablo type of game functions finely with any number of pieces (or any size of board). Several variants have been implemented. Sigrid Drake (1918, p.291) relates a variant from Aasele (Åsele), Swedish Lapland. 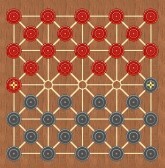 It includes 18 pieces plus king on each side, on a 41 square board. It is also implemented, as Dablo Aasele. Drake, S. (1918). Västerbottenslapparna under förra hälften av 1800-talet. Uppsala: Almqvist & Wiksell. Keyland, N. (1921). ‘Dablot prejjesne och Dablot duoljesne’. Etnologiska Studier. Göteborg. Pettersson, O.P. (1999). Nybyggares dagliga leverne. Umeå: DAUM. Pirak, A. (1937). En nomad och hans liv. Stockholm: Nord. Wiklund, K.B. (1892). Note: catalogue nr. 71978. Nordiska Museet (Stockholm, Sweden). ☛ You can download my free Dablo Daares program here (updated 2010-03-14), but you must own the software Zillions of Games to be able to run it (I recommend the download version).